For women, hair is closely linked to feminity and beauty, so hair loss can be devastating and it can really affect confidence and self-esteem. There are many causes of hair loss, from stress, to hormonal imbalance, illness, chemotherapy, and over processing with chemicals, and the cause of your hair loss will determine the treatment that you need. We shed around 80-100 hairs every day naturally, but people with this condition lose far more. There is a thinning of the hair rather than bald patches, and the scalp and the hair that’s left will most likely look healthy. This type of hair loss is usually temporary. It usually happens 1-3 months after the body is put through stress, so it might be that you notice it after having a baby, having surgery, or after an illness. This stressful event stops some of the older hairs from growing and they shed sooner than they should. Hair growth usually returns to normal within a few months after the stressful event. No treatment is usually offered for this condition, as the hair grows back in time. In the event that the hair loss has been caused by a nutrient deficiency, taking supplements can help. This is a disorder that causes sufferers to compulsively pull at their hair, because of anxiety, stress, or even boredom. It can start at any age but it’s very common in teenagers. Because hairs are pulled out randomly, there is not typically a pattern of hair loss, and sufferers might also pull at their eyebrows or eyelashes. Treatment for this disorder must include some form of cognitive behavioural therapy before physical treatment of the hair loss is even considered. This is the most common reason for hair loss in women. It’s also known as androgenetic alopecia and it’s a hereditary condition which causes changes in your hair follicles. The follicles shrink, so any new hair growth will be finer, shorter and less visible, until it stops growing completely. Even though this type of hair loss is hereditary, there are still things you can do about it, like using Nioxin treatments to improve the health of your scalp and keep your hair follicles clear, which will encourage healthy hair growth. The most common form of alopecia is alopecia areata. This is an autoimmune disease, where the body’s immune system attacks the hair follicles. Patches of hair loss develop, followed by complete baldness in some cases. The patches are usually round and they can appear quite quickly. The hair usually grows back, but for some people, hair loss is permanent. Sometimes when the hair grows back, it can appear lighter in colour, and bald patches can grow back then reappear elsewhere on the scalp. There are rarer types of alopecia; alopecia totalis, which results in the complete loss of the hair on the head, and alopecia universalis, where all the hair on the body, including underarm hair and the eyebrows disappears. As far as treatment goes, the medical options are usually steroid injections or immunotherapy, and many people opt for wigs or hair replacement systems to camouflage their hair loss. Topical hair loss treatments are also worth a try. Are you worried about hair thinning or loss? At Salon La Reine we can help. 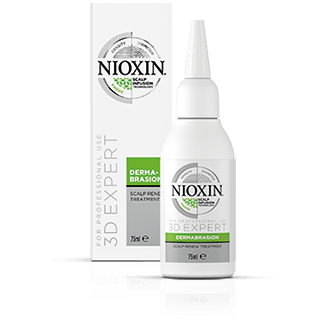 We have the Nioxin treatment system and product range in the salon, so if you’re worried about hair thinning or loss, come in for a consultation and rediscover thicker, fuller hair that shines with health. Hair loss is a common and devastating problem. 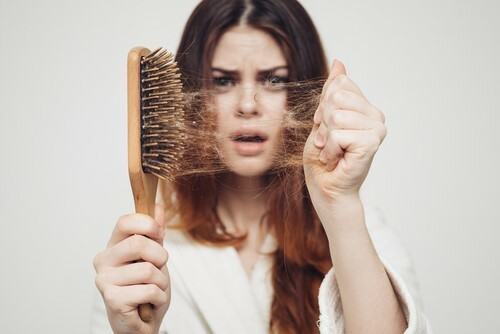 Shedding around 100 hairs every day is perfectly normal, but it can be a shock when you see clumps of hair in your hairbrush or shower. For women, hair is strongly linked to feeling feminine, and losing it can really knock your confidence. Stress or shock raises the level of male hormones (androgens) in the body which shortens the hair’s growth cycle and causes the hair to fall out. If your diet isn’t up to scratch it will show in your hair. Make sure you get enough iron, vitamin B12, and protein in particular. Iron is needed to produce hair cell proteins, B12 is needed for healthy blood cells and good circulation to the scalp, and protein is the building block of hair. Medical conditions like thyroid problems and polycystic ovary syndrome can cause hair loss, as can treatments like chemotherapy, and medications like anti-depressants and blood thinners. Hair loss can occur when the hair is damaged by over processing, or when it is subjected to a lot of trauma or tension by wearing hairstyles that pull too much on the hair or wearing badly-fitted hair extensions. 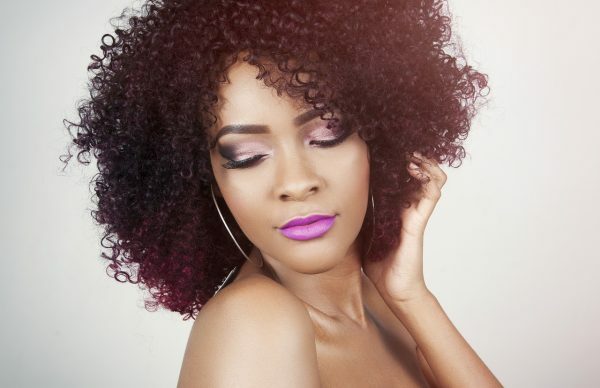 What can you do to kickstart healthy hair growth? Well the experts agree that healthy hair starts with a healthy scalp. If your scalp is dry or irritated, or if your hair follicles are clogged, healthy strands of hair can’t grow. Why not try Scalp Renew? Your hair follicles can get clogged up with dead skin cells and oils, and this can impede healthy hair growth. Scalp Renew by Nioxin is our new in-salon scalp exfoliation treatment which we like to call ‘a facial for the scalp.’ The treatment helps get rid of any build up of dead skin which allows newer and healthier cells to come to the surface. Healthy hair is much more likely to grow from healthier cells. Who is Scalp Renew suitable for? It’s perfect for anyone with a scalp condition who would benefit from an exfoliating treatment. Anyone with sores, scalp tenderness, or a rash should not have this treatment and should seek advice from their doctor or a trichologist. The product is massaged into the scalp for about a minute then it’s left on for 10 minutes then rinsed off. Your hair is then washed and styled as usual. How often should you have the treatment? Having a treatment every 4-6 weeks should be enough to see results. See how the treatment is working for yourself! We have a Nioxin Nioscope in the salon which is a powerful microscope than can let you see the condition of your scalp before and after treatment, how amazing is that? It’s always good to know that your spending your hard-earned cash on something that really works! If you’re anything like me, you’ve probably made a few New Year’s resolutions. Maybe you want to eat healthier, get fitter, or learn something new. But have you made any New Year’s resolutions for your hair? Here’s how you can start some healthy hair habits in 2019. If you haven’t already, put some time aside in your week to really take care of your hair. Use the right products for your hair type, use a hair masque regularly and book in for regular trims to keep your hair looking at its best. Get rid of bad habits like blasting your hair with heat and using straighteners every day too, embrace your natural texture and let your hair dry naturally once in a while. Hydrated hair is healthy hair, and if hair is dry and brittle, it won’t look good or feel good and it will be so much harder to maintain. Deep conditioning treatments penetrate the hair at a deeper level than normal conditioners. Do a treatment once per week and you should see results within a few months. A poor diet will show in your hair, so make sure that you eat plenty of lean protein, fruit and veg, and healthy fats to encourage healthy hair growth. Supplements can help, but they should be taken as well as a healthy diet, not instead of one. As I mentioned earlier, let your hair dry naturally now and again, and if you must use heat, always use heat protection products. Ask me about gentler ways of colouring your hair or embracing your natural colour, and if you wear extensions, we can look at fitting methods that aren’t so damaging. 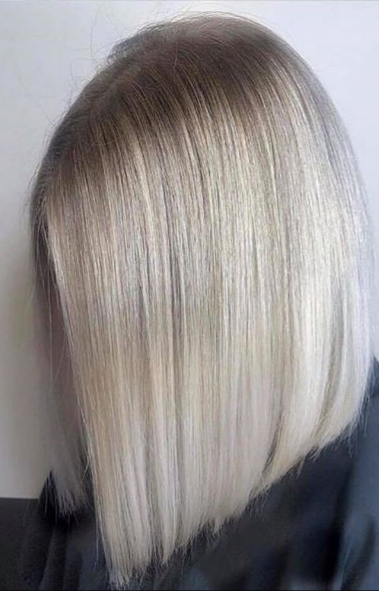 Here’s to shinier, happier, healthier hair in 2019 and beyond! If you have fine hair, you might consider getting hair extensions so you can have the full luscious mane you’ve always dreamed of. But some hair extensions aren’t suitable for fine hair, and they can cause damage and hair loss. 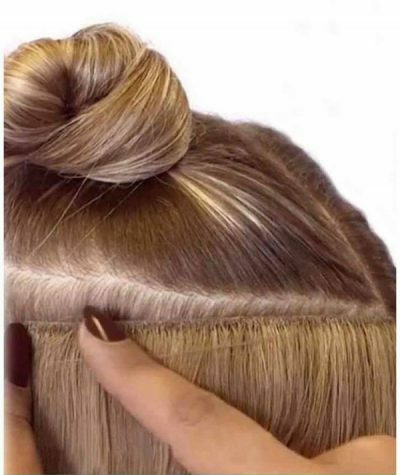 Clip-in hair extensions: These are an easy to use quick fix, but constantly clipping the hair in and taking it out can pull on the hair causing damage and hair loss. You should never leave these in when you go to sleep either. Braided wefts: Tight braids can pull on the hair and weigh it down, and fine hair is not usually strong enough to withstand this. Keratin pre-bonded extensions: The strands are attached to the hair with keratin. The bonds can feel quite heavy and can weigh down and damage fine hair. 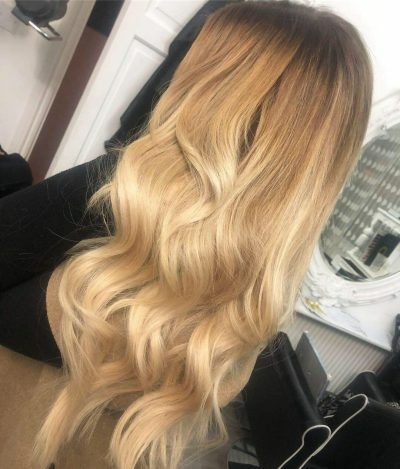 But if you want bonded extensions and you have fine hair, Great Lengths prebonded hair extensions bond is made from polymer which is much kinder to the hair than Keratin. You can also ask your stylist to cut the strands in half to 0.5g and 0.2g at the temple and nape where the hair tends to be finer. The bond tip (glue) can also be cut down so there’s less weight altogether. So what are the best hair extensions for fine hair? My recommendation for fine or very fine-haired ladies would be tape-in hair extensions. The hair wefts are applied to your natural hair using a special tape. The wefts are nice and light so they won’t cause any pull on the hair. 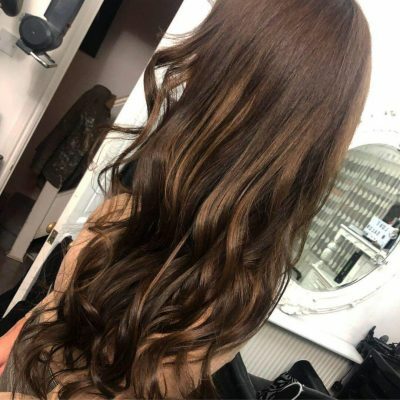 They lie flat against the scalp so they won’t be able to be seen either, which would not be the case with many other types of hair extensions. Use the products that have been recommended to you and your extensions will look great for longer. Always wash your hair in the shower with your head tilted back, and don’t scrub your scalp hard as this can damage the tape. Never use conditioner near the roots as this can make affect the tape’s adhesive. Don’t rub the hair dry with a towel. Pat it dry to remove excess moisture then either let your hair dry naturally or blow dry on a low heat, avoiding the tape. Get into the habit of brushing your hair, from the roots upwards a few times per day. Wear your hair in a loose plait or ponytail at night to avoid matting and tangles. Do you have fine hair? Are you thinking about hair extensions? Ask me about the best options for you! The cold weather and dark nights might have you dreaming of holidays and you might already be thinking about where you’re jetting off to in the summer. But if you have hair extensions, you’ll need to think about looking after them a little bit more when you’re faced with a swimming pool full of chlorine and endless days of sun exposure. Here are my top tips for looking after your hair extensions on holiday. The last thing you want is to get to your hotel and find out that you’ve forgotten your hair extension shampoo and conditioner. Resorting to cheap hotel shampoo or shampoos full of sulphates can dry your extensions out. Always use the products I’ve recommended to keep your extensions looking amazing. Salty sea water and chlorine is a nightmare for hair extensions. 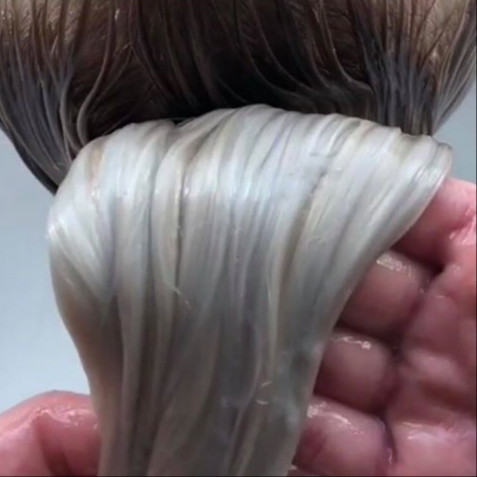 This type of water can make them dry and even discoloured, especially if you’re blonde. If you want to have a dip, pre-treat the hair with a leave-in conditioner or protective pre-shampoo treatment to prevent dryness. Wear your hair in a plait or another easy to manage style if you intend to swim. Avoid styles like messy buns as these can make the hair tangle. Wind or sea air can make the hair a bit harder to control so make sure you brush it regularly to keep it looking good and tangle free. You might think that on holiday it’s so warm your hair will dry faster, but if you go to bet with wet hair it can end up matted and tangled. Make sure your hair is dry and put it in a loose ponytail or plait before going to bed. Just as you should always protect your skin from the sun, you should always protect your hair extensions. Too much sun exposure can make your hair extensions look and feel bone dry. Try wearing a hat or apply an extension friendly leave-in hair UV protection product. See me when you get back! When you come back from holiday it’s a good idea to come and see me for a maintenance appointment so I can check your bonds are tangle free and see if any hair needs removing or replacing. Even if your gym routine has fallen by the wayside because of Christmas shopping and parties, it’s probably going to be among your resolutions for the new year. But does a gym bunny lifestyle rule hair extensions out? The good news is that no it doesn’t, and you can still get a sweat on when you have hair extensions as long as you follow these rules. Sweat is salty and it’s quite acidic so it can dry out hair extensions and make them rough and coarse. Try to keep your hair away from your forehead and neck by wearing it in a ponytail or a bun. If you’re really serious about avoiding sweat, try wearing a headband which will reduce the contact your hair has with the skin. Tying the hair too tight can damage the bonds and pull the extensions out. Tight ponytails are bad for your natural hair too as the stress from traction can cause hair loss. You can still use them, but wear a swimming cap or shower cap to protect the hair and bonds from the heat and humidity. Extremes of temperature can melt adhesive and weaken the bonds so your extensions are more likely to start falling out. Many women who have hair extensions fitted think that they won’t be able to swim ever again but that’s not true. While it’s true that chlorine can dry out the extensions and affect adhesives, you can wear a swimming cap or apply a conditioner and tie the hair up to ward off some of the negative effects. Wash and condition your hair with a sulphate-free shampoo and conditioner straight after swimming. This applies after you have a sweaty workout too. It is important to keep your hair up and out of the way, so some great ideas for gym hair extension hairstyles are high ponytails or buns, French braids, plaited buns, and ballerina buns. Messy buns are a no no because they can cause matting and tangling. Remember too that with some hair extension fitting methods, the bonds will be visible if you tie your hair up in certain ways so it might be a case of trial and error, and seeing what works for you. You invest a lot of time and money into getting hair extensions so it makes sense that you should look after them. 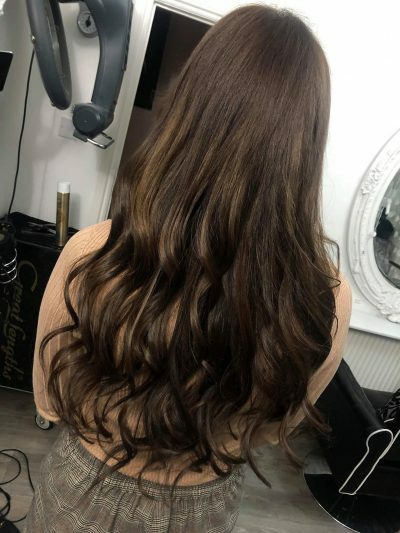 As well as looking after them at home, like I talked about in the last blog, you need to make sure you’re having regular maintenance appointment to keep your extensions looking as good as when you first had them fitted. I’ll always talk to you about maintenance before you have your extensions fitted. I’ll tell you what’s involved, how often you should book a maintenance appointment, and how much maintenance will cost. Why do you need hair extension maintenance appointments? During a maintenance appointments I can check the health of your extensions and your natural hair. I can also sort out any matting or tangles before they cause problems. Removing matted and tangled hair extensions will take longer and cost more. If you don’t book maintenance appointments, your extensions might not last as long. Around every 6 weeks, I’d replace any missing bonds with new hair and refit any bonds that you find uncomfortable. 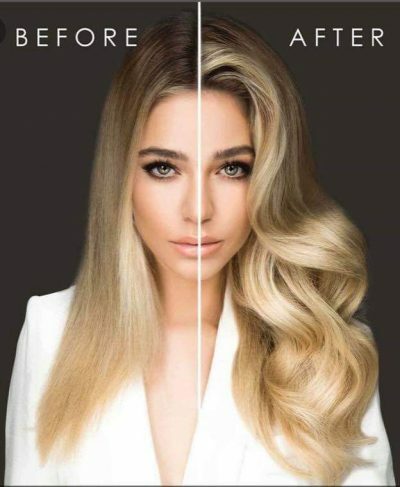 This will keep the extensions looking as good as when you first walked out of the salon. Every 6-8 weeks, each bond is unclipped and moved back up to where it was originally before any new hair growth. What if I’m not offered maintenance appointments? I always offer maintenance and recommend that clients book maintenance appointments because hair extensions are an investment. If you go to someone who fits hair extensions but doesn’t offer maintenance, my advice to you would be to run a mile and take your custom somewhere else! Remember that maintenance does not just happen in the salon though, it’s about using the right hair products, brushing the hair correctly, tying your hair up before bed and during exercise, and following any other aftercare advice that any good extensionist will give you. Let’s face it, good quality hair extensions are an investment, so it makes sense that you want them to look as good as possible for as long as possible, right? 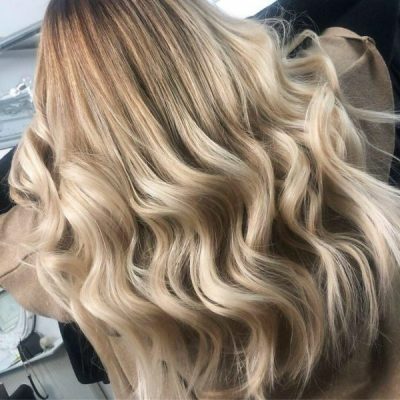 But to make sure they do, there are some rules to follow that will keep your locks looking as amazing as you did the day you stepped out of the salon. After I’ve fitted your extensions, I’ll give you some aftercare advice including how to generally look after them, which products you should use, and maintenance. Please follow it, it can make the difference between your hair looking amazing for months, or looking dry and matted after just a few weeks. Use the correct products. Some products contain sulphates that can dry out hair extensions because they don’t get the beneficial oils from your scalp. When you wash your hair, don’t rub as this can cause matting. Instead, gently wash it from roots to ends. Rinse out the shampoo thoroughly then apply conditioner, but avoid the roots as it can loosen the bonds and cause your extensions to fall out. Pat the hair dry with a towel, then use a hair extension brush or wide toothed comb to detangle the hair, working from the ends upwards. Try to minimise the amount of heat you use on your hair, and never use heat near the bonds as it can weaken them and cause your extensions to slip out. If you want to use hair oils, make sure you don’t use them near the bonds as it can cause them to loosen, as can any products containing silicon. You don’t want your beautiful extensions falling out! Tie your hair up in a loose ponytail before bed and never go to bed with damp hair as this can cause tangling. Avoid exposing your extensions to chlorine or salt water for too long as it can make your extensions look like a matted mess. If you do go swimming, wear a swimming cap and tie your hair up. Shampoo and condition your hair as soon as you’re out of the pool. With any other type of exercise, always be sure to wear your hair up and out of the way, and of course, wash it as soon as you can. Do your extensions look and feel dry after just a few washes? This might be due to the products you’re using and the fact that, unlike our natural hair, hair extensions aren’t attached to the scalp, so they don’t get the benefit of natural protecting oils or nutrients. Use nourishing products and avoid those that contain sulphates or alcohol, which can dry the hair out. At Salon La Reine, we offer a wide range of hair extensions to suit every client with every hair type. In today’s blog, I want to focus on Braidless weave sew-in hair extensions and how they’re a great way to add length and thickness to your hair without using heat, glue, or braids. Micro rings are applied to your hair horizontally then wefts are sewn across the micro rings to attach them securely. They lie much flatter to the head and because there’s no braid, there’ll be less tension on your natural hair which can cause hair loss and damage. The wefts can easily be reused and repositioned. Without braids, the extensions are much more comfortable to sleep in. Braidless weaves can be fitted fairly fast, usually in 1-2 hours. They don’t tend to last as long as pre-bonded or micro ring hair extensions. The weave needs to be moved further up your hair every 6 to 8 weeks as your natural hair grows out. The micro rings will need to be moved or replaced. If you follow the proper aftercare advice I give you, the extensions should last around 4-5 months. There’s no problem with washing your extensions, but if you wash your hair very day, I’d advise you to reduce this and to only wash your hair with the recommended products. If you wash your hair extensions with the wrong shampoo, they won’t last as long. Your hair will feel heavy at first but after a few days, they’ll feel more natural. Do braidless weaves damage natural hair?